Overview: Years ago, The Avengers defeated a version of Ultron and trapped him in a rocket headed for space. Now, years later, a new team of Avengers must contend with a planet-sized Ultron with the ability to wipe out all life in the universe. 2015; Marvel Comics; 112pgs. 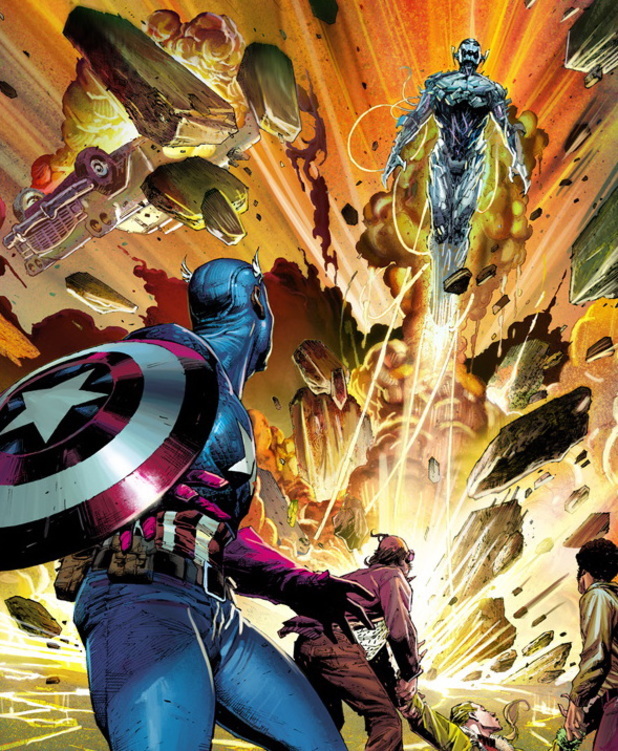 Written by Rick Remender; Illustrated by Jerome Opena, Pepe Larraz, and Mark Morales. Despite All My Rage: “The savage monkeys are rage-filled and claustrophobic. Climbing over another to nowhere. Confused by logic, they dismiss it. Choosing instead to bend their knees to the convenient fantasy of custom-built gods.” And so begins the Rage of Ultron, with a striking takedown of humanity and the superheroes they depend on. Ultron is frequently considered to be the greatest of the Avengers villains, because his relationship to them has always been a personal one. A creation of Hank Pym, the original Ant-Man, Ultron’s plight is an oedipal one. There’s a quality to the relationship between the two that’s very much Shakespearean. Writer Rick Remender takes full advantage of that by crafting some memorable monologues and complex character interactions that get to the root of their relationships. While the graphic novel is billed as an Avengers title, Rage is very much centered on Pym, Ultron, and Ultron’s android creation-turned-Avenger, the Vision. While the Avengers all get their time to shine, and there is no shortage in explosive action, the story is very focused the familial dynamics of these three characters. Jumping On: Rage of Ultron wastes no time getting started, and the battle scenes and drama never let up, making for a quick read. If you’re unfamiliar with Remender’s work (Uncanny Avengers is highly recommended) you should know that he’s a writer who isn’t afraid to push comic book concepts to their most fantastic potential. The result is an unforgettable and thematically resonant work that has ramifications over years of storylines. You won’t see the same tired tropes reheated with Remender, but at the same time his work is not always the best jumping on point for new readers. Those looking for a quick introduction to the characters and set-up featured in Age of Ultron may find themselves disappointed and a little lost. The opening act of the original graphic novel focuses on the core team of Avengers from the mid-70s before jumping ahead to the current iteration of the team that’s made up of very few of the Marvel Cinematic Universe’s recognizable characters. Rage of Ultron is deeply entrenched in continuity. I commend Remender for creating a story that matters, instead of creating an alternate reality meant to closer reflect the movies, but I think new comic readers should be willing to do a little wiki-hunting in between turning pages. New Form: As an original graphic novel, instead of a series of single issues bound together, Rage’s pacing eliminates the lengthy set up and overarching mystery found in monthly comics. The lack of setup leaves most of the book feeling like a climax, which isn’t bad, only different. The nature of monthly comics is often compared to movies in terms of how they build and introduce characters and locations, but Rage, with its limited locations and characters, feels far more like the third act of a play. Worry not, though; there’s still plenty to look at. The artwork by Jermone Opena provides healthy serving of eye-candy. His color scheme and hard, edgy lines give the book far more of a sci-fi look than that of a traditional superhero adventure. There’s some fill-in art by Pepe Larraz and Mark Morales in the second half of the that’s solid work, but ultimately a little distracting and disappointing given the book’s format and release schedule. As a still relatively modern and untapped format for Marvel, original graphic novels are still finding their footing, but this is defiantly their best effort in this direction so far, mostly because it feels so essential to the Marvel Universe at large. Overall: While it’s not new-reader friendly, I encourage those interested in comics to give it a shot. Part of the fun of comic reading is just diving in and finding your way around. Rage of Ultron offers one of the best written depictions of Ultron and is certainly a much better exploration of the character than 2013’s Age of Ultron (from which the film takes its title but not its story). With a smartly written plot, gorgeously detailed art, and a ballsy twist ending that’s going to have major ramifications in the future, Rage of Ultron offers plenty for those invested in the Marvel Universe and those wanting to increase their fevered excitement for the Avengers big-screen return.